Have you ever been curious why Google and other search engines rank some websites above others in search results? It’s time to learn what they’re looking for. Search engines want to return the most relevant and most helpful results for their searchers. To figure out who is most relevant and most helpful, there are a number of ranking factors they are known to consider. SEO resources tell us that Google’s algorithm considers over 200 ranking factors to determine search results. Some ranking factors have more weight and are more important than others. Here, I am going to cover the ranking factors that are most important and make the biggest impact for wedding vendors. When Google looks at your website, will they see these positive signals? Google won’t rank your website, page, or blog post if they can’t figure out what it is about. I always recommend that my clients use their focus keyword clearly on the page that they would want to rank in search results. It should be used in the page title, page content, meta title, and meta description for that page. However, this does not mean you should force your most important focus keyword (i.e., “wedding photographer in Greenville, NC”) onto every page, blog post, title, and image name on your website. While that tactic may have worked years ago, it is now seen as keyword stuffing. If you do this, your website may be penalized as spam. A link to your website from another relevant website is like a “vote” for your website’s quality. In SEO, we call these “backlinks,” and backlinks are really important. Building quality links is hard work and doesn’t happen quickly. That’s why Google favors pages and websites that have a lot of other websites linking to them. The assumption is: this website is good if other people are talking about it. A link to your site from your friend’s travel blog is less useful. A word of caution— Never try to game the system by exchanging links with friends or buying backlinks. You need to be very careful to avoid Google penalties caused by spammy link creation, the equivalent of a “get rich quick” scheme. Always aim to earn high-quality, real links back to your site. The way searchers interact with your website and your listing in search engine results is becoming increasingly important. Google has the ability to track which listings are clicked in their results. They also monitor if a user clicks your website and then quickly clicks the back button to return to the search results and keep looking. 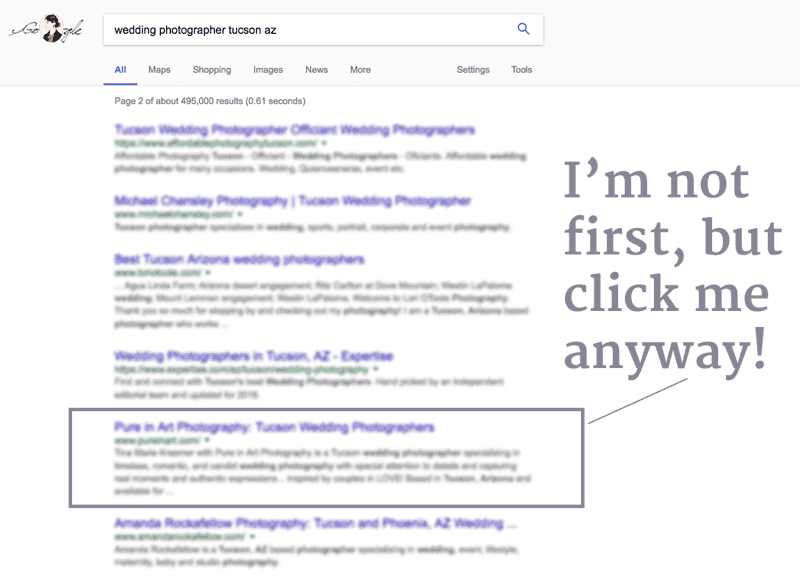 If users in search results consistently click a listing that isn’t first, Google may move it up. So, try to make your meta title and description as interesting as possible. More words means you likely used more synonyms and variations of your focus keyword. Search engines will understand better what your page is about. I know the tendency when posting weddings on your website is to “let the images speak for themselves.” Writing is hard if it’s not your creative medium, and sometimes you don’t know what to say. 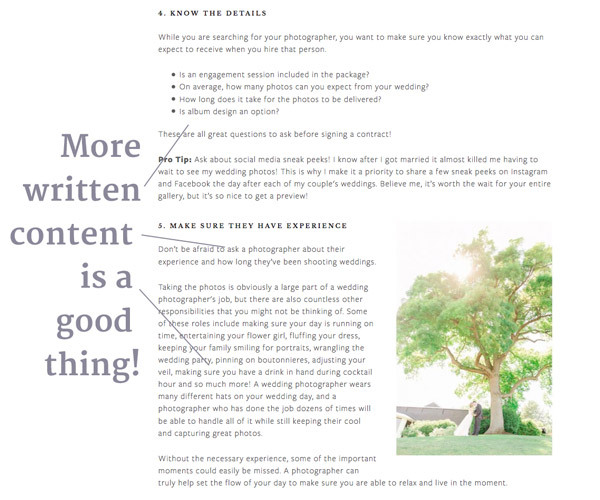 But don’t skimp on written text on your pages or blog posts. Writing more is one of the biggest ways you can differentiate your site from other vendors. Whenever you post a wedding on your website, I highly recommend writing compelling, helpful content to go along with the images. Write more! It helps Google to rank your page higher. Ask a few quick questions of the other vendors if you see them. Take notes if possible and include their quote about the flowers, the photos, the tablescape, the location, the music choice, etc. In addition to having more written content on each page, Google also tends to prefer websites that have more pages overall. A site with 40 high-quality pages and posts is likely to rank better than a site with just 10 shallow pages. Still, you don’t want to publish weak, short content just to have the biggest site out there. My recommendation is to publish blog posts regularly (weekly, bi-weekly, or monthly) to grow your content over time, without making it too overwhelming. Search engines like to see websites and content that are newer or updated recently. Information on a newer or recently updated page is less likely to be outdated for the user, so Google gives it a boost. This is just another reason to publish blog posts regularly. Google will see the activity as a site that is fresh and relevant. You may also want to consider adding new weddings to your portfolio every few months and updating your bio and About page a couple times a year. Other factors being equal, faster websites rank better. This is because website users do not have the patience to wait for your site to load once they click on your search listing. They’ll bounce back to the the search results if they wait too long. We want pages to load in three seconds or less (preferably way less). 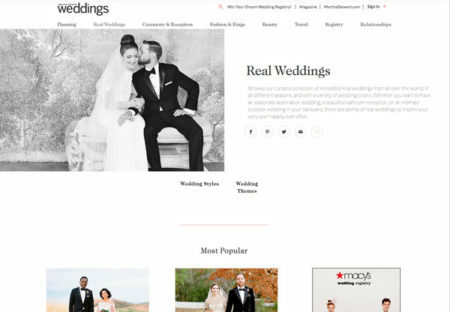 For wedding vendors, images are often the biggest culprit for slow-loading sites. Make sure your images are compressed and optimized for web before uploading to your website. Cheap shared website hosting, badly coded themes, and technical issues can also cause slow load speed. Social media activity is a bigger ranking factor than ever before. When your content is linked to, shared, liked, and commented on on social media, search engines learn that it is interesting to users. When you post a new wedding to your website, share the link on Twitter and Facebook. Feel free to share it again on the couple’s anniversary or when it’s relevant. Search traffic on mobile devices (smartphones and tablets) is higher than ever. To make sure searchers on mobile are happy with their results, Google started giving rankings boosts to websites that are mobile friendly in 2015. Google recommends having a responsive website. That means your website adjusts its layout based on the size of the screen. It is not recommended to have a separate website for mobile visitors (like m.yourwebsite.com). How often do you test how easy your website is to use on mobile? If you’re trying to drive traffic from Instagram, Facebook, and search engines, it better be. You can test whether Google thinks your website is mobile-friendly using their Mobile-Friendly Test tool. As I mentioned before, there are hundreds more factors that search engines consider when building search rankings. But—these are some of the most important. As I mentioned numerous times in my post What Is Search Engine Optimization?, your number one goal should be to make your website helpful to your site visitor. Understanding ranking factors can guide you in building a better, more helpful website and help you reach rockstar status on Google.